Cabinet ventilation is a tricky proposition. Whether you are venting a piece of ductwork that is covered by a cabinet that was moved or a microwave vent, or venting heat out of a media cabinet, we have the cabinet cooling systems and parts to do the job. Find cabinet vent grilles and other products for cabinet cooling systems here. Toe Kick Grilles - Standard white & brown, brass, wood, and cast iron. Pipe & Fittings -Pipe, wallstack, ductwork, and microwave wall caps for cabinet ventilation. 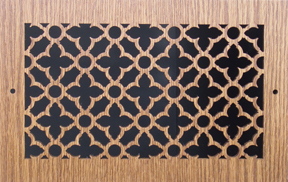 Laser Cut Grilles - Wood grilles that are great for speaker cabinet ventilation. Custom sizes are available.